316 Stainless Steel Probe with Nylon Overmolded M12 A-Coded 4-Pin Connector (IP67). An M12 Extension Cable is Required for Installation. The PR-22 style M12 RTD sensor is similar to our PR-21A sensor except that it has an overmolded M12 connector (vs. a machined housing). This allows the PR-22 sensor to be a lower cost alternative to the PR-21 if an integral mounting thread is not required. Nylon Overmolded 4-Pin M12 "A-Coded" Plug Style Connector. 1/4" and 1/8" Diameter Probes in 6", 9", 12" 18" and 24" Lengths. 6mm and 3mm Diameter Probes in 150, 250, 350, 500, 750 and 1000mm Lengths. 4-Wire Pt100 or Pt1000 (100 ohms at 0°C or 1000 ohms at 0°C, .00385 TCR (alpha)) Platinum RTD. Accuracy: Class A or Class B per IEC 60751. 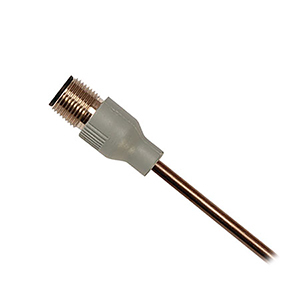 Temperature Ranges are: -30 to 350°C (-22 to 622°F) Class A Accuracy, -50 to 500°C (-58 to 932°F) Class B Accuracy and -50 to 90°C (-58 to 194°F) Connector End. Insulation Resistance: 100 Megohms Minimum at 100VDC at Room Ambient Temperature. Extension Cables with silicone, polyurethane or PVC cables and straight or right angled connectors. In-line transmitters like the Omega SPRTX-SS and TX94A-SS series transmitters with integral M12 connectors. Data loggers, data aquisition systems and recorders. Stainless steel or brass compression fittings. Or use them as replacement sensors in thermowells using Omega's spring loading kit. The PR-22 RTD sensor contains an RTD element that meets the resistance vs. temperature requirements of IEC 60751, making it compatible with most of the proccess control and measurement equipment on the market today. The integral M12 connector, wired in a 4-wire configuration, provides customers the flexability to use it in any 2-wire, 3-wire or 4-wire application depending on your equipment or measurement accuracy needs. Note: For Class B element accuracy, change "-A" in model number to "-B" and subtract $4 from the price.